Harney Peak is accessible from several trails traversing Black Elk Wilderness in the Black Hills National Forest. The most popular Harney Peak hiking trail begins near Sylvan Lake, in Custer State Park. 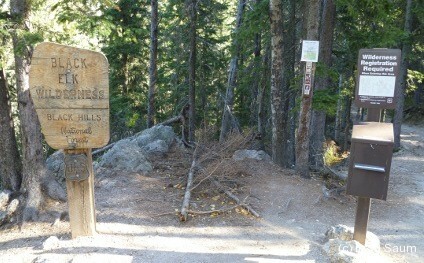 Trail Number 9 to Harney Peak starts in the upper parking area at Sylvan Lake. Hiking Harney Peak originates in Custer State Park and then the trail traverses the Black Hills National Forest to the summit of Harney Peak. 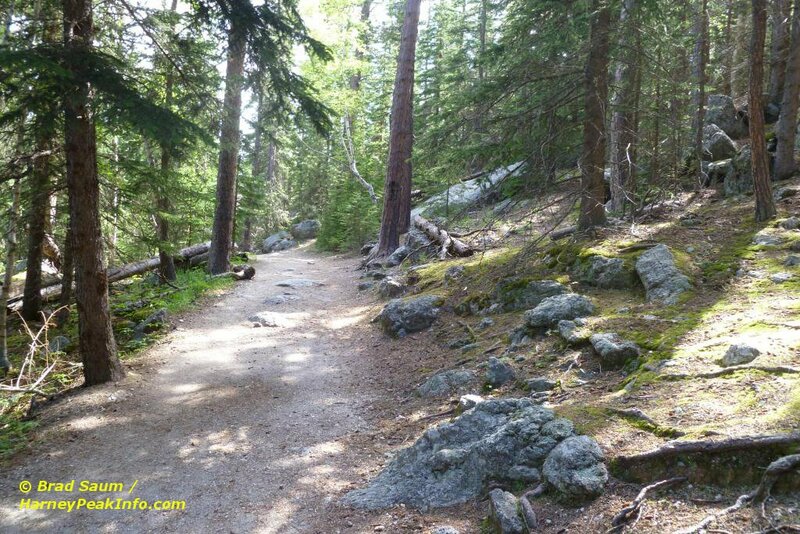 This Harney Peak hiking trail is heavily used, especially during the summer months. Hiking to Harney Peak requires no technical climbing skills. Along the four mile trail to Harney Peak, there is an 1,100 foot elevation gain from Sylvan Lake to the summit of Harney Peak. The trail to Harney Peak begins as an easy stroll through the pine forest and becomes more strenuous closer to the summit of Harney Peak, including several switchbacks for the final push to the high point. Hiking Safety Reminder: Harney Peak is located in a wilderness area. Sheer granite cliffs drop eighty feet from the peak. Exercise caution to remain safe during your Harney Peak hiking highpoint adventure. The Harney Peak summit off in the distance. Stone stairs on path to Harney Peak.